Physicians urge the use of massage therapy to treat auto accidents and sports injuries. 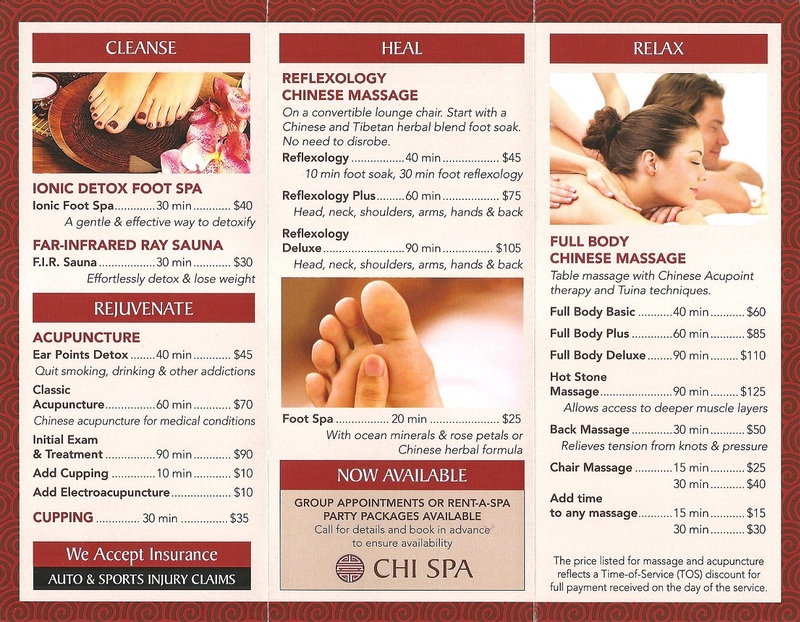 At Chi Spa we considered massage a very important therapeutic treatment to calm, relax, and sooth the mind, body, and soul. Acupuncture is an important component of Traditional Chinese Medicine that involves the placing of thin needles at specific bodily points and is used to treat and prevent a range of conditions and illnesses, such as chronic pain and axiety, even colds and flu. Researchers found that the needles stimulate deep sensory nerves that tell the brain to release natural painkillers (endorphins) and other factors to enhance your body's own healing process. Far Infra Red sauna is an equipment that makes you sweat through the far infra red radiation - commonly know as heat radiation. It's a great way to detoxify. Sweating is also an important treatment method in the traditional Chinese medicine. It's an effective way to combat a range of cold and stagnant conditions, such as the common cold and flu, certain types of arthritis and overweight. The ionic foot spa is a soothing and relaxing 30 minute session, during which your feet soak in a warm foot bath. As the session starts the water will begin to change color and sometimes objects may appear as a result of the chemical reactions between the toxins in your body, and the particles in the water, such as salt and metals in the array. The resulting products depend on the toxins in your body and the acidity of your body. It helps you to get rid of these toxins and cleanse corresponding parts of your body.